LOOK AT THEATRE AND MOVIE EPHEMERA FROM GOLDEN BENDIGO. Western theatrical traditions came to Bendigo with fortune seekers in the 1850s. Since then, everything from amateur to professional, Shakespeare, opera, live music, eisteddfods, Vaudeville, musicals and comedy have graced the many stages in Bendigo. The beginning of the 20th century heralded the dawn of the motion picture, which by the middle of the century was the most popular form of entertainment. Existing Bendigo theatres quickly adapted and numerous purpose built picture theatres were constructed. Theatrical traditions: stage and screen in Bendigo looks at key moments, venues and people in the evolution of such entertainment in Bendigo. The exhibition runs until 14 March 2016. It is free. 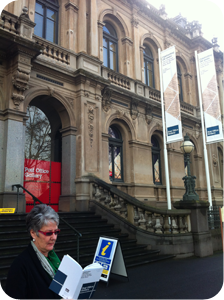 A full-colour exhibition catalogue will be available from the Bendigo Art Gallery shop. While we have yet to visit this exhibition, our experience with this gallery has always been very rewarding.